Samsung datový kabel ECC1DP0U, 30pin->USB, pro tablety Samsung, černá. Galaxy Tab™ Data Cable (Charging) USB to 30 Pin. 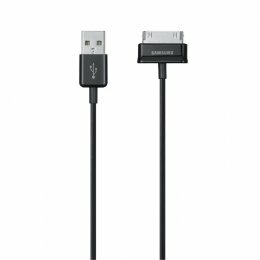 This SAMSUNG 30-Pin to USB Charging Data Cable provides the ability to connect your SAMSUNG Galaxy Tab™ to your compatible PC allowing your Galaxy Tab™ to become an external modem while also charging and syncing your data. Use this data cable to connect your Galaxy Tab™ to a PC or SAMSUNG charger. Also use it to connect your HDMI Multimedia Dock or Full Size Keyboard Dock to your PC or SAMSUNG charger.